The EyeCare Universe summer sale will offer savings of up to 50% off select sunglass frames. They would also like to congratulate Jordan Dubbs for winning the Father’s Day contest. EyeCare Universe is an online retailer of contact lenses, contact solutions, designer eyeglasses, contact lens removers, designer sunglasses and other eye care products. 17 years of experience and being an authorized Luxottica retailer, has helped give EyeCare Universe some of the most competitive prices online. For over 17 years, EyeCare Universe (formerly known as CLE) has been servicing the city of Cleveland Ohio for all of their contact/EyeCare needs. 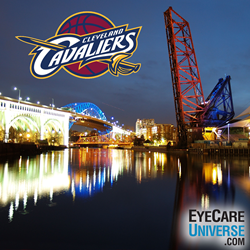 From one CLE to another CLE, everyone at EyeCare Universe would like to extend their congratulations to the Cavaliers. This great accomplishment deserves a great sale to commemorate the first day of summer. This past weekend Eyecare Universe conducted a Father’s Day contest on Facebook in which one lucky winner would win a free pair of non-polarized Ray Ban sunglasses for their father. On Monday, EyeCare Universe congratulated Jordan Dubbs for winning the Father’s Day Contest. Jordan cited his father’s love for the 1980’s classic TOP GUN, writing “…he would blast the opening scene with the fighter jets taking off as Kenny Loggins' "Danger Zone" roared in the background. His neighbors were never happy, but my dad loved that scene.” Jordan will receive a pair of non-polarized Ray-Bans for winning and his dad is sure to love them. The summer sale began on June 20, 2016 and will run for the majority of the summer. Select sunglass models will be up to 50% off, which means this is one sale no one will want to miss. Getting this type of savings from an authorized Luxottica dealer, such as EyeCare Universe is great for consumers as they are saving money and have the peace of mind that comes with buying from an authorized dealer. In order to take advantage of this offer, all one needs to do is visit the summer sale page and choose for the select pair of sunglasses on that page and that’s it. No coupon code is needed to take advantage of this offer. EyeCare Universe is headquartered in Elmsford, NY, with offices in NYC and New Jersey. EyeCare Universe specializes in high quality eye care products, like contact lenses and designer sunglasses and is an authorized Accuve dealer.